GI Joe : The Complete Story of America's Favorite Man of Action - More than a toy, GI Joe's fully articulated body and many accessories represented a miniature template for our own developing personalities. 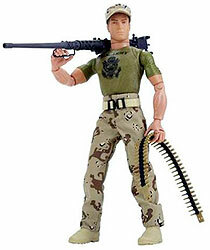 GI Joe was a blank slate that needed us to make all of his decisions, from how he dressed on any particular day to what sort of mission he'd embark on. We shaped his personality in the way we expected to turn out as grown-ups: we made our friend courageous, trustworthy, loyal, strong. Certainly the traits of a good Adventurer, but also the qualities of a parent, or neighbor, or co-worker, or any of a dozen roles we fill every day. When adults encounter GI Joe again, they're reminded of that simple vision of their own potential. No little cartoon-based plastic action figure with molded-on clothes and a written-in-stone "backstory" can compare to that sort of relationship. While GI Joe: The Complete Story of America's Favorite Man Of Action tells the tale of the best boy's toy ever made, it's inside account of Hasbro's progress from a seller of textile remnants to an enormous multi-national company provides a capsule view of the history of the entire American toy industry. As one of GI Joe creators said to me, the story of GI Joe's creation and evolution is a virtual business and marketing seminar. The Complete Encyclopedia to G.I. Joe - Get a firm grip on your G.I. Joe collecting. This newly revised and expanded second edition gives complete information, including original and today's pricing for every G.I. Joe, equipment package, vehicle, item and box, and every piece of original paperwork produced from 1964-1995. Plus you'll find full illustrations of the original Action Series heroes, the 1970s Adventure Teams, the 1980s Force figures, and the ultra-modern 1990s Sonic Warriors.